Voting for the 2009 Streaming Media Reader's Choice Awards ends on Friday, October 16th, so make sure to case your vote. 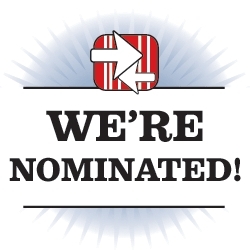 We're honored to be a nominee in the online video platforms (premium) category this time around and would appreciate your help and support in the voting process! The winners will be announced at Streaming Media West in San Jose on November 18 and presented during a gala reception at the show. To vote, just go to http://www.streamingmedia.com/ReadersChoice.